2009 is the Dutch Jaar van de Tradities (Year of the Traditions). At the end of the year of the traditions I will show you how we traditionally end our year: With oliebollen, the number four tradition in the top 100 of Dutch traditions. Oliebollen (singular: oliebol) are basically deep-fried balls of dough, sometimes with raisins - think donuts without the holes. They are eaten with powdered sugar. Many people make their own (and if they did you can often still smell the oliebollen days later in their kitchen), but in the last few days of the year they are also widely available from bakeries, supermarkets and market stalls. 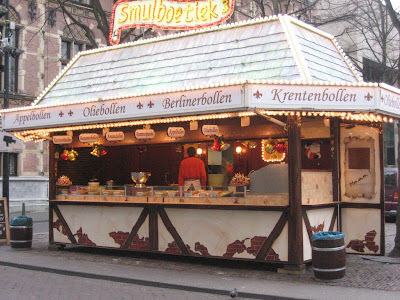 Around November, stalls like the one on the photo, selling mostly oliebollen, pop up everywhere, and in the first days of January they disappear again. The photo was taken on a quiet morning in mid December. There were no customers at that time, but probably quite a few later in the day. If you visit in the afternoon of 31 December, you will have to wait in line for a long time, even though there are several people serving. If you want to try to bake your own oliebollen I'll share the recipe with you. Mix yeast and lukewarm milk. Add flower, eggs and salt and mix well to make a smooth dough. Optionally add the raisins and stir through the dough. Put the dough in a bowl and fully cover the bowl. Let it rise for at least an hour on a warm place - don't take off the cover while it's rising! Using two wet dining spoons, let small amounts of dough - a spoonful per oliebol - slide into the hot oil. Keep the spoons wet (or slightly greasy) to prevent the dough sticking to the spoons. Deep-fry for about six minutes. For best results use a fork to turn them half-way through. Serve hot or cold, with powdered sugar. Enjoy! I love oliebollen and always buy some from the local bakery for St. Nicolas Day. Of course, here they are called donut holes and probably aren't as good as the homemade ones. Thanks for sharing the recipe. I'll have to try it!